Polka Dot Baby Shower Game - Free, printable game cards for your baby shower! 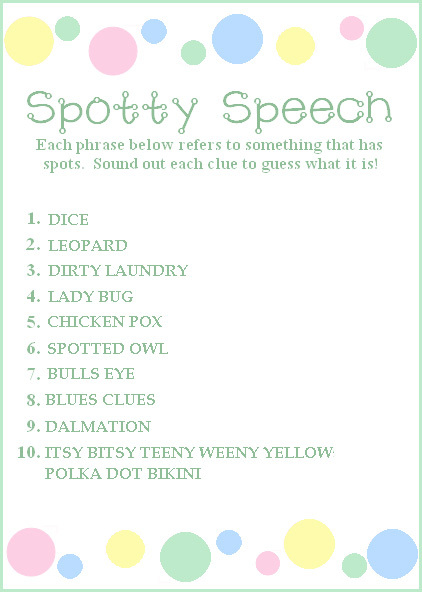 Print out this cute game that adds a fun flair to a Polka Dot Baby Shower Theme. You can play this game two different ways. First Way: Break up all of the guests into teams of two, and give each team one of the game cards (print them out below). 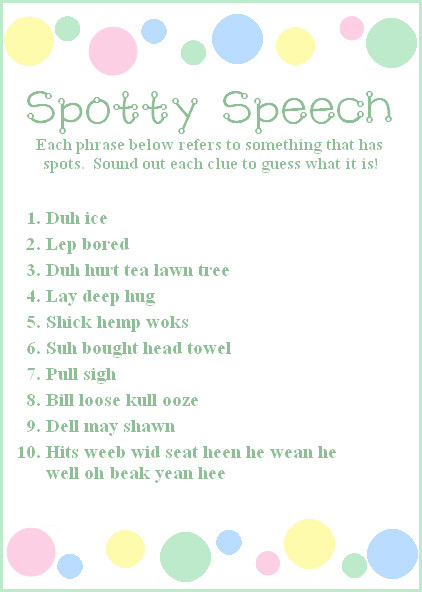 Then give them 5 minutes to figure out each of the 10 “spotty words”. Second Way: Have each guest play the game individually. Print one of these game cards out for each of your guests. Give each one a pen or pencil and give them 5 minutes to figure the words out. You have several options to print this polka dot theme game. Whichever way you choose, I suggest that you print these game cards on a thicker cardstock for a quality, sturdy game card. The EASIEST way to print this game is to open this pdf Polka Dot Baby Shower Game and print it from there. May this polka dot baby shower game take some of the stress out of your planning. Best Wishes on Your Baby Shower! !